IMTAL-Europe hosted the 5th biennial International IMTAL conference from September 20-23, 2007 in Belfast, Northern Ireland. The theme of the conference was "Challenging Museum Theatre." Delegates attended sessions, performances and workshops that reflected the topics for each day: Interpreting Belfast, Museum Theatre - What's the Point? and What's Next for Museum Theatre? Participants learned the latest techniques in live interpretation from around the world, dealing with some of the most difficult subjects facing museums, galleries, and visitor attractions. In debating the significance and relevance of museum theatre, delegates participated in developing and directing its future. Sessions were scheduled at different venues, and one day included a field trip option, allowing delegates to visit museums around the country. 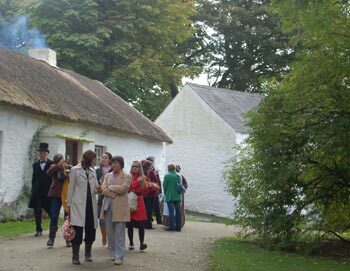 Sites visited included the Ulster Folk and Transport Museum, the Ulster American Folk Park, the Navan Centre, and W5, Belfast's science centre. Highlights are available in the conference Photo Gallery. For the full collection of photos compiled by IMTAL-Europe, click HERE. More information is also available on the IMTAL-Europe web site.